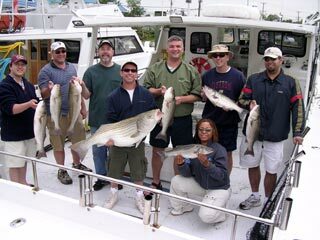 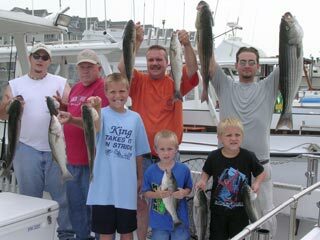 The Lee King (4th from left) crew with their fine catch of stripers on June 25. 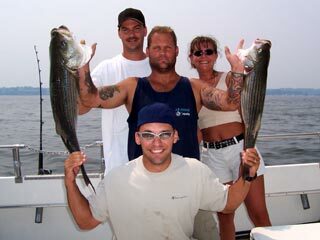 The Fred Gers (2nd from left) crew after a catching their limits of rockfish on June 24. 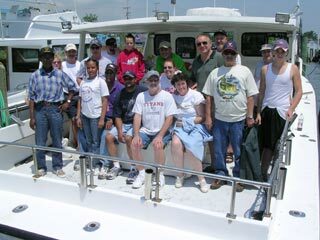 The crew from Power Solutions, led by Chuck Horton, after a great day of catching stripers on June 24. 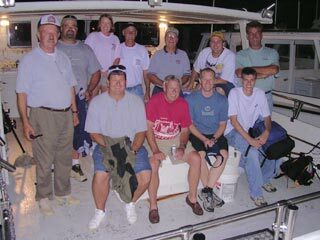 The Art McCrea (4th from left, rear) crew after a fine afternoon of catching stripers on June 23. 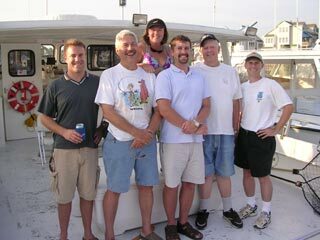 Another crew from 84 Lunber, led by Jim Kimball (2nd from left), shown with some fine rockfish they caught on June 23. 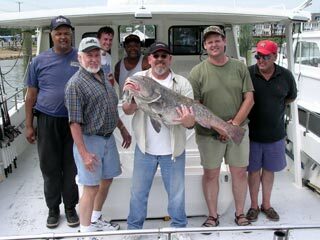 Another crew from New Penn, shown with a huge black drum they caught on June 19. 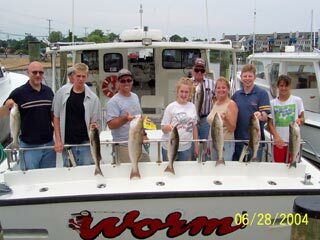 The crew from R & R HVAC on June 18, shown with some of their fine rockfish. 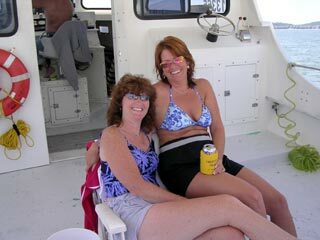 Birthday girl Melissa (2nd from left) with Donna, Ray, Tammy, Mary Louise, and Deena (front), out for a day on the Bay. 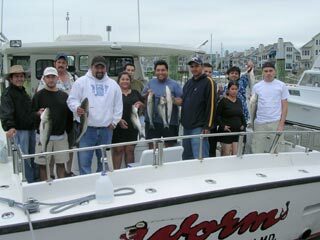 The Richard Carpio (middle, blue) crew from June 13, with some of their rockfish. 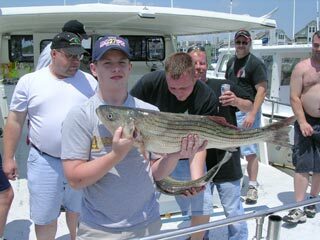 Tony Vespico holds up a 39 inch, 30 lb. 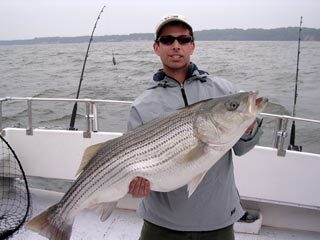 big strper from June 4, the biggest striper we've caught in a month. 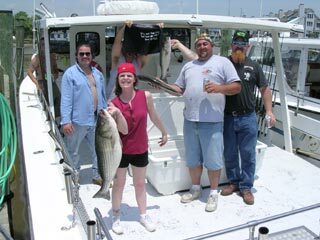 She should have been off the Jersey Coast by now. 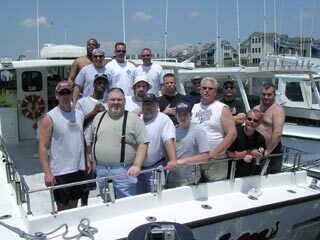 Here's the crew from DC Fire Company Engine 27 (Deanwood), who fished with us during the 2004 Emerald Society Tournament. 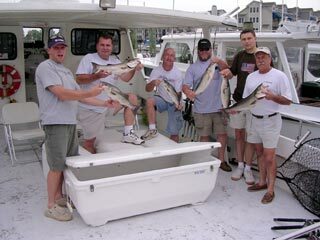 Close, but no cigar. 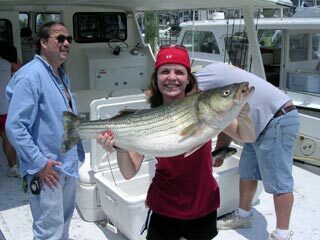 This 33 inch striper was a fine catch, but not quite big enough to place in the tournament. 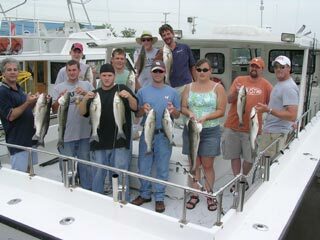 Here's a crew from Tom Friday Inc., led by Tom Friday of course (2nd from right) after a fine morning catching stripers on June 2. 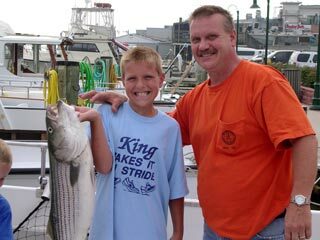 Say "cheese". 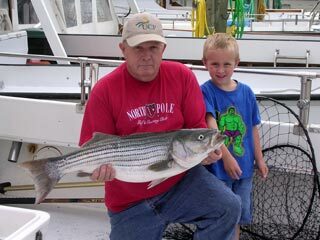 Captain Drew (that's him on the right...) with a 7.5 lb. 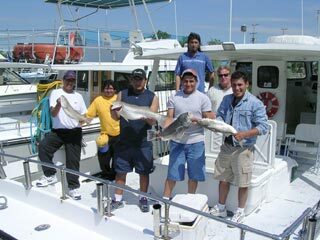 tautog or blackfish that was caught while fishing for drum on June 2. 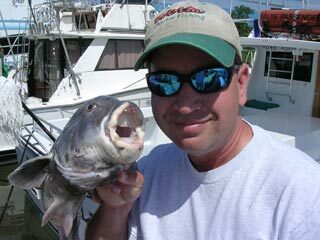 Tog have huge teeth for crunching up mussels and clams.